This week’s Friday Field Foto (the 100th!) is inspired by Callan’s post this morning about his recent trip to the Torres del Paine region of Chilean Patagonia. He mentioned coming across a clastic intrusion during one of their hikes on the north side of the Paine Massif. I’ve never been to that exact location but these clastic intrusions, known as ‘injectites’, are relatively common in this sedimentary basin. I’ve probably posted these photos before but I think it’s been well over two years since then so it’s worth a re-post. The exposed strata here is slightly dipping siltstone and thin-bedded sandstone turbidite beds. There is no scale out on that cliff because it is incredibly steep and too dangerous to climb out on. The sand beds that you can see in the lower left of the photograph — right near the greenish plant — are on the order of 5-10 cm thick. Also note the non-flat “beds” on the other side of the exposure — the lighter-colored features cutting across the strata in a near vertical orientation. These are sandstone injectites. The next photo below zooms in a bit more. In addition to sandstone intrusions in this region, there are also conglomerate injectites! For real. those right-stepping dikes in your zoomed in photo – is that a primary geometry? Or is there a bit of slip along the bedding offsetting a previously contiguous dike? I’m also curious about the bedding-parallel offset. Wherever we can see it, it’s systematically “upper-dike-to-the-right”. Flexural slip maybe? What about the lateral change in color we see in the background of the photo? Is it a fault? or the outcrop is covered by some debris? Christie and Raymi … I honestly don’t know much about these geometries, nor have I thought about them in that way. These things are screaming for more structurally minded researchers to study. All I can say is that the offset of segments of the intrusion are real. Some colleagues of mine collected a bunch of data of the orientations of these things, but I’m not sure whatever happened to that. I’ll have to see. Raymi, I’m not exactly sure which lateral change in color you are referring to. If it’s in the lower photo how the thin sand beds disappear from left to right, then, yes, it’s a fault. 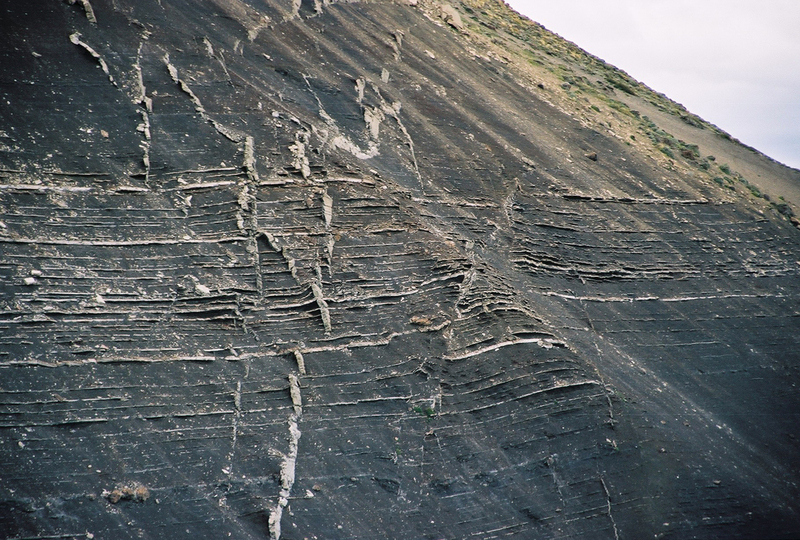 It’s a growth fault — which is a bit difficult to see in this view — and what’s more is that the orientation of the injectites is parallel to the orientation of the faults. These strutural faults seem down to left.There are also a part of a conjugate set of faults. More chances are there that these faults have played an impotant role in the sedimentary history of the deposits. 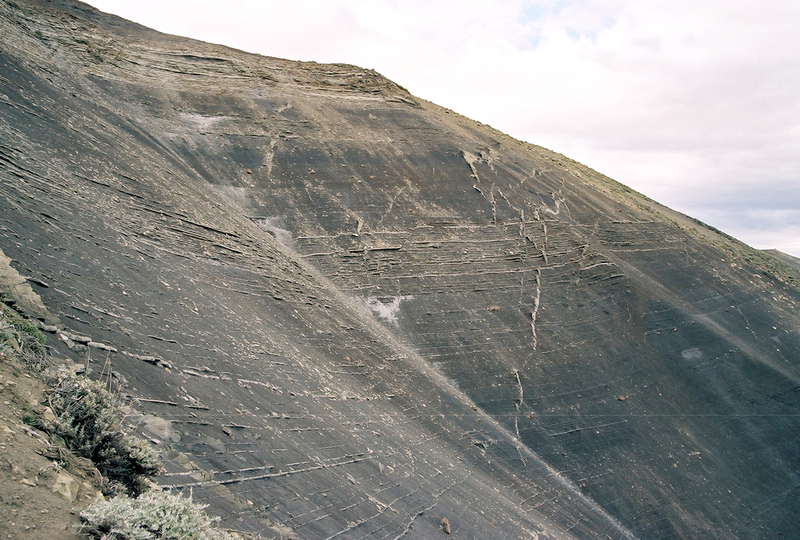 haroon … check out this paper, which goes over the details of this outcrop, including structural influence on sedimentation. I’m curious to know if you have an idea where the parent sandbody is ? At the bottom or at the top of these sand injectites ? I’m working on similar objects in southest of France (Sisteron area). You can consult Parize et al., 2003… but it’s not me Parize.